From Balem, Brazil, and the Inter Press Service comes news of the efforts taken by indigenous peoples to send a message to the 2009 World Social Forum (WSF), being held in northern Brazil. 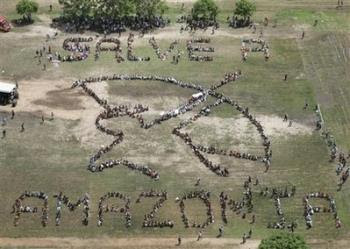 The Coordinating Committee of Indigenous Organizations of the Brazilian Amazon (COIAB) joined the Quito-based Coordinating Body of Indigenous Organizations of the Amazon Basin (COICA) to send their "message from the heart of the Amazon," that "our concern about global warming, whose impact we will be the first to feel, although we, the peoples of the Amazon, have protected and cared for the forests," said Francisco Avelino Batista, an Apurinán Indian from the Brazilian Amazon. The key location chosen for the WSF, and the various global crises that are occurring, have created "a special moment" for original peoples to take a leading role, according to Roberto Espinoza, an adviser to the Andean Coordination of Indigenous Organizations (CAOI). "A crisis of civilization" is under way, said Espinoza, who described the serious economic, energy and food problems, as well as climate change, as part of the same phenomenon. In this situation, indigenous people should have political participation as of right, not "as folklore or as a merely cultural contribution," Espinoza, one of the coordinators of the indigenous peoples' presence at the WSF, told IPS.The Declaration on the Rights of Indigenous Peoples, approved by the United Nations General Assembly, is of paramount importance here, he said. It should not be seen as a "utopian" document; rather, its provisions should be binding, like those of the International Labor Organization's Convention 169 on indigenous and tribal peoples.